Kubota’s F90-Series offers multiple innovations for unparalleled comfort, power, traction and versatility with cleaner Tier IV emissions standards and enhanced fuel efficiency. At the core of the series is an efficient, clean performance Kubota diesel engine that delivers 25.5 hp to the F2690E and F2690, and 39 hp to the F3990. The F90-Series’ high torque rise ensures faster, smoother recovery under sudden loading, allowing the operator to power through tall or wet grass without slowing down. Each F90-Series model has a single-speed pedal hydrostatic transmission allowing for quick response directional changes and varying speeds to keep the operator’s hands free for steering and implement control. Each model has a 16.1 gallon fuel tank to minimize fuel stops between jobs, and Auto-Assist four-wheel-drive that works in forward and reverse to ensure appropriate traction and prevent landscape damage. The Series’ PTO shaft drive offers a smooth and direct power transfer from the engine to the deck and other PTO-driven attachments. And, because there are no belts or pulleys, less overall maintenance is required. The heavy duty commercial mower deck comes with an improved baffle to prevent cut grass from discharging to the front, and a larger discharge chute for better discharge performance. The side or rear discharge mower is available in 60” and 72” widths and both tilt up 90 degrees for easier cleaning and blade sharpening. The F90-Series’ fabricated steel mower deck is stronger and more durable than conventional pressed steel decks and is designed to provide years of reliable cutting performance with minimal maintenance. The deck’s 6-inch deep design lets tall grass stand up so that it can be cut more efficiently, resulting in a faster cut and cleaner appearance. A high lifting capacity gives the F90-Series the versatility to handle an array of implements, including a grass catcher, snow blower, rotary sweeper, debris blower, front blade, and the 100” flex mower deck. An easy-to-install one-piece cab enclosure is also available for winter applications. With a tilt steering wheel and adjustable, deluxe high back seat, plus a large operator platform and ergonomically placed levers, operator comfort comes standard with any F-Series model. 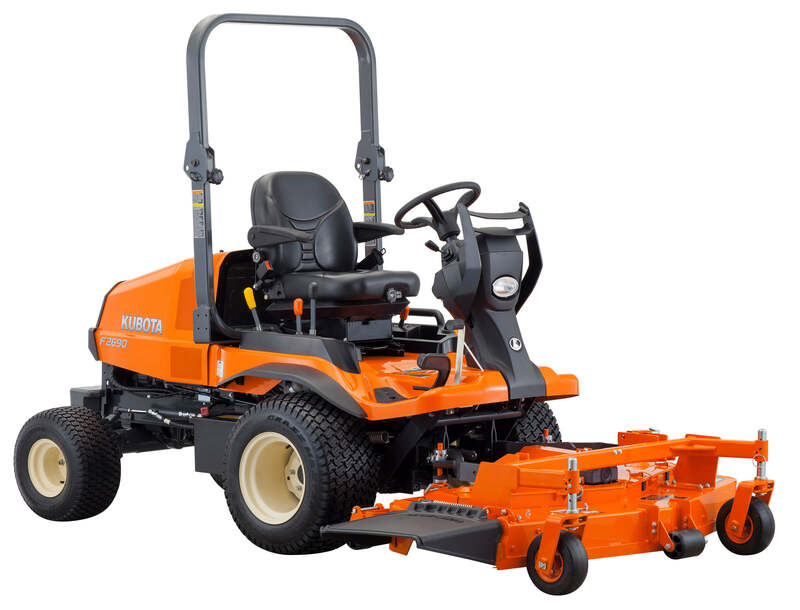 Designed for easy serviceability, the F90-Series offers simple maintenance with a quick-release engine cover and 90-degree tilt mower deck ensuring operators can get back to the job quickly.